Lounging on your (admittedly meh) couch drooling over home decor magazines is one way to spend a Saturday. But how about actually creating your own cozy oasis? Before you eschew the idea with an “I’d love to, but [insert excuse here],” Homepolish interior designer Kerry Vasquez wants you to know that transforming your home into the space you’ve been pining over (and Pinning over) actually is possible—you just might need an assist. She, and the whole Homepolish team, are on hand to pull your imagined look together and manage the whole project—making the transformation process as enjoyable as the final design (without killing your bank account). Still not convinced? Turns out, giving your home some love can actually be a really powerful wellness practice (the Marie Kondo method didn’t catch on for nothing). And while you’re busy channeling all your newly inspired productivity into your own passion projects, Homepolish will be taking care of business. The interior design and renovation service hooks you up with a designer hand-matched to your project, plus contractors and construction specialists if needed. So every step of the process is handled—from turning those magazine pages into a space you can actually Instagram IRL. Ready for the upgrade? Scroll down for her 5 reasons to take the interior design plunge. Your talent for finding chic home decor Instagram accounts knows no bounds, but actually hunting down the pieces pictured in those photos is a next-level skill. With your personal designer on deck, you can trust they’ll do all the detective work for you. Not that your bargain-hunting skills aren’t totally prime, but finding deals is your interior designer’s literal job—so you (and your bank account) can rest easy knowing you definitely got the best price on that antique-style vanity you’ve always wanted. “Besides using trade discounts, being aware of big sales, or knowing inexpensive yet high quality vendors, a good designer should be able to narrow in on what you’re looking for quickly, and then design the home of your dreams with an ease that you may never have been able to achieve on your own,” Vasquez says. Three cheers for making it look easy (and saving money). “The main benefit is that it turns transforming your space from something that could potentially be super stressful and time consuming into (hopefully) an incredibly fun, easy and creative experience,” says Vasquez. “I don’t think there is any way hiring an interior designer doesn’t save you time.” How’s that for major busy-person appeal? Homepolish designers handle everything in the process so you can focus on the other things that occupy your super busy days—like nailing your work assignments and sweating it out at hot yoga. 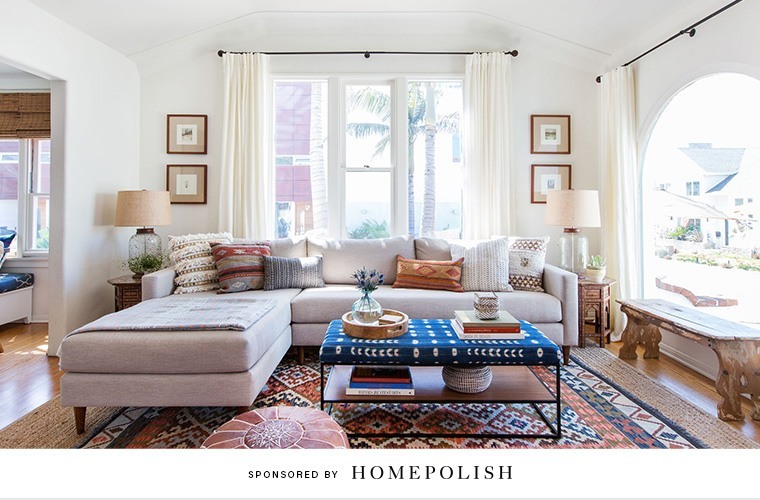 From helping you pick out the pieces you want, placing the orders, and handling returns (which can be a total headache)—Homepolish is basically your personal design guru. You’d never plan on giving up your dream home (obviously), but sometimes, life happens. Investing in your home’s design will help ensure you turn a tidy profit if you have to move on. Carbon-copying that bedroom you found on Pinterest sounds nice in theory—but it wouldn’t leave you with a personality-filled space that feels like home. And for Vasquez, that’s one of the most important parts of interior design. The verdict: It might be time to start looking at your vision board as a source of inspo (rather than a game-plan you need to execute)—and letting an expert fulfill your dream-digs status.